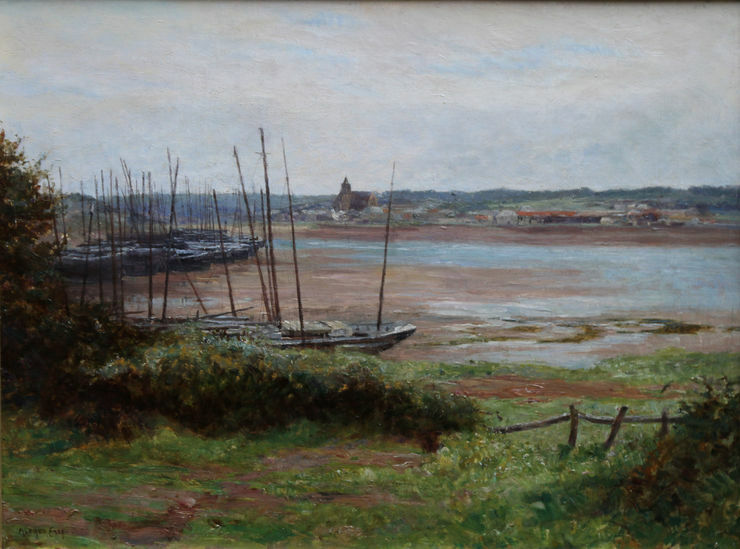 A very fine and delicately painted oil on canvas by Alfred East RA which depicts Hayle estuary Cornwall. 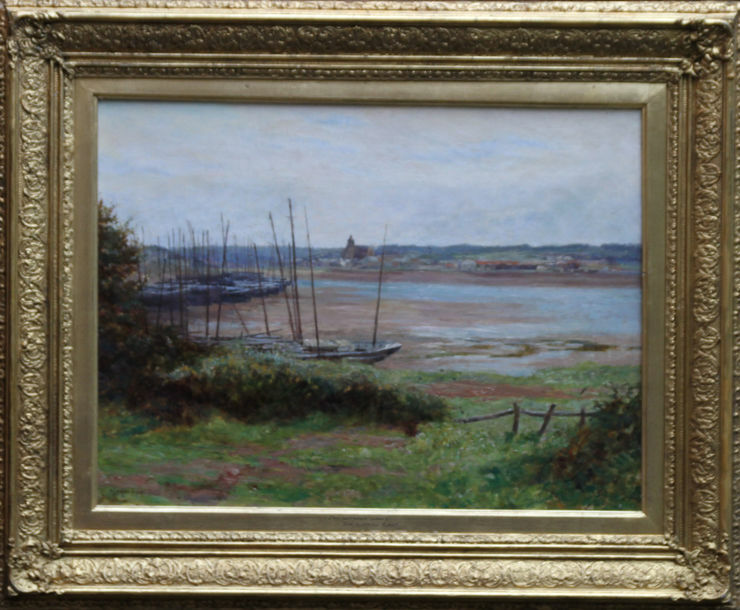 It is a marine boating scene with the church in the distance. It was painted in an impressionistic pallette circa 1900. A beautiful large oil on canvas with multi layers of colour. In excellent condition in a fine Victorian gallery frame. Excellent condition 32 inches by 28 inches. East was born in Kettering in Northamptonshire and studied at the Glasgow School of Art. His romantic landscapes show the influence of the Barbizon school. In April 1888 he shared an exhibition at the galleries of the Fine Art Society with T.C. Gotch and W. Ayerst Ingram. He was commissioned the following year by Marcus Huish, Managing Director of the Society, to spend six months in Japan to paint the landscape and the people of the country. When the exhibition of 104 paintings from this tour was held at the Fine Art Society in 1890 it was a spectacular success. East visited Spain after 1892 when he visited Algeciras at the southern end of Iberia. In 1906 he was elected President of the Royal Society of British Artists, a position he held until his death. In that year, he published his 107-page illustrated "The Art of Landscape Painting in Oil Colour"; in its preface, he made the observation: "The greatest errors in landscape painting are to be found – contradictory as it may appear – not so much in the matter of technique as in the painter's attitude toward Nature". In this book he described his techniques using colours, half-tones and pencil sketches. He was awarded a Knighthood in 1910 by King Edward VII. His portrait was painted by Philip de Laszlo. The Alfred East Art Gallery in Kettering, designed by John Alfred Gotch opened on 31 July 1913 and is Northamptonshire's oldest purpose-built art gallery. East was elected an Associate of the Royal Academy in 1899, having been a regular exhibitor since 1883 and elected to full membership in 1913. On 28 September 1913, Alfred East died at his London residence in Belsize Park. His body was taken back to Kettering and lay in state in the Art Gallery, where it was surrounded by the pictures he had presented to the town, and attracted crowds of several thousands.